Red Azalea by David Reese, one of Central Florida's best known watercolorists. Reese began his art studies at the High Museum School of Art in Atlanta, Georgia, and continued at the Art Students League and the Fashion Academy (both in New York), and at Florida State University in Tallahassee, Florida. He taught at the Fashion Academy, Atlanta Art Institute, Armstrong State College in Savannah, Stetson University in Deland, and Valencia Community College (present-day Valencia College) in Orlando. Reese, formerly the director of the Loch Haven Art Center in Orlando, was also an instructor at the Creald้ฉ School of Art in Winter Park, where he taught classes and workshops in watercolor. Reese typically paints segments of nature by taking a small portion of a scene and blowing it up as big as 30 inches by 40 inches. He also occasionally uses slides as references, and says he will take a scene as small as a quarter of the slide and magnify it to huge proportions. Finally, Reese also occasionally paints landscapes. In his technique, Reese relies mainly on composition and subject matter for impact. Original watercolor painting by David Reese: City of Orlando Terrace Gallery, Orlando, Florida. Digital reproduction of original watercolor painting by David Reese. Originally created by David Reese. "Art Center Shows Reese's Watercolors." The Orlando Sentinel, April 5, 1987. http://articles.orlandosentinel.com/1987-04-05/news/0120150289_1_reese-watercolors-school-of-art. Reese, David. 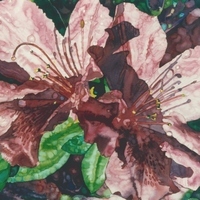 “Red Azalea by David Reese.” RICHES of Central Florida accessed April 22, 2019, https://richesmi.cah.ucf.edu/omeka/items/show/5352.